National Public Works Week (NPWW) is a celebration of the tens of thousands of men and women in North America who provide and maintain the infrastructure and services collectively known as public works. Instituted as a public education campaign by the American Public Works Association (APWA) in 1960, NPWW calls attention to the importance of public works in community life. The Week seeks to enhance the prestige of the often-unsung heroes of our society-the professionals who serve the public good every day with quiet dedication. APWA encourages public works agencies and professionals to take the opportunity to make their stories known in their communities. Over the years the observances have taken many forms, including parades, displays of public works equipment, high school essay contests, open houses, programs for civic organizations and media events. The occasion is marked each year with scores of resolutions and proclamations from mayors and governors, as well. Some special highlights of NPWW include a United States Senate resolution affirming the first National Public Works Week in 1960, letters of acknowledgment from Presidents Dwight Eisenhower and Lyndon Johnson, and a Presidential Proclamation signed by John F. Kennedy in 1962. From the beginning, the selection of a Top Ten list of exceptional public works professionals has been a cornerstone of NPWW. The program has identified more than 400 men and women who reflect the highest standards of professional conduct for public works officials. These honorees have been recognized for discharging critical responsibilities in connection to the design, construction, maintenance and/or operation of major public works projects or activities in large and small municipalities throughout North America. Often their accomplishments are particularly noteworthy in relation to the limited manpower and financial resources available to them. National Public Works Week is observed each year during the third full week of May. Through NPWW and other efforts, APWA seeks to raise the public's awareness of public works issues and to increase confidence in public works employees who are dedicated to improving the quality of life for present and future generations. 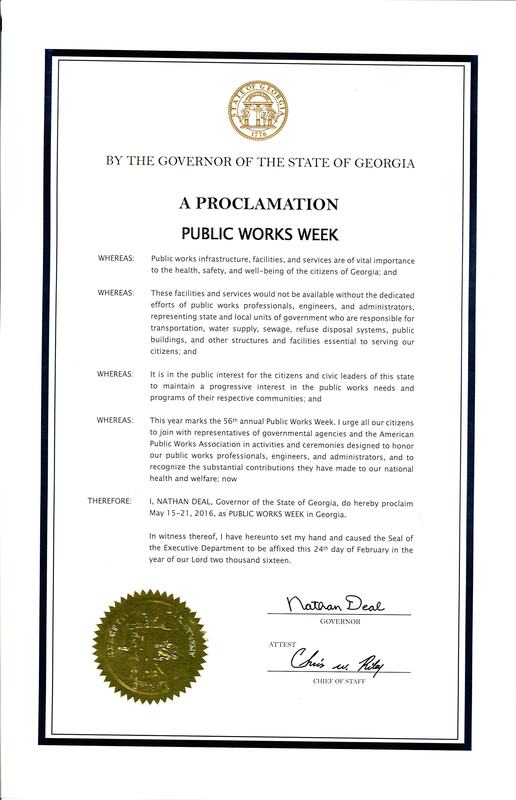 To honor the 56th Annual National Public Works Week, Governor Deal signed a Proclamation on April 19 proclaiming May 15-21, 2016 as Public Works Week in Georgia. To view a copy of the signed Proclamation, please click here. To celebrate National Public Works Week several Cities, Counties and other Agencies are hosting events to bring more awareness to the Public Works profession throughout Georgia. Please visit our Chapter Facebook page to various National Public Works Week Events throughout the State.